1976: Prix Georges Montefiore, Association of Belgian Electrical Engineers, for best original research in electrical engineering during the period 1970-75, for the book "Feedback Systems: Input-Output Properties"
1981: E. W. R. Steacie Memorial Prize, Natural Sciences and Engineering Research Council of Canada, for being an outstanding young researcher. 1983: Fellow, Institute of Electrical and Electronics Engineers (IEEE), "For contributions to the stability theory of linear and nonlinear distributed systems"
1984: Frederick Emmons Terman Award, American Society for Engineering Education, for combining teaching and research excellence. 1987: Best Paper Award, Society of Instrumentation and Control Engineers, Japan. 1997: Scientist of the Year, Defence Research and Development Organisation, Government of India. 2002: Best Paper Prize (Methodology) from the International Federation of Automatic Control (IFAC) for the paper entitled ``Randomized algorithms for robust controller synthesis using statistical learning theory.'' This paper was adjudged to be the best "methodology" (theory) paper published in the journal Automatica during the period 1999-2002. 2004: Named as one of "Forty Tech Gurus" in the November 2004 issue of IEEE Spectrum. 2005: Jawaharlal Nehru Centenary Lecture Prize, Indian National Science Academy. 2008: IEEE Control Systems Award, for "Promulgation of control science and engineering and contributions to robust control, robotics and statistical learning theory"
2011: Harry H. Nyquist Lecture Award, American Society of Mechanical Engineers. 2012: Fellow, The Royal Society, United Kingdom. 2012: Fellow, The Institute of Physics, United Kingdom. 2012: Rufus Oldenburger Medal, American Society of Mechanical Engineering, "For his fundamental contributions to robust control theory, specifically L1-optimal control theory for linear control systems; nonlinear control theory, especially input-output stability theory; robotics, including the control of flexible beams; statistical learning theory and machine learning; and computational biology"
2013 John Ragazzini Education Award, American Automatic Control Council, "For outstanding contributions to automatic control education through publication of textbooks and research monographs"
My Erdös number is two and my Einstein number is three. The papers in these two chains are given below. P. Erdös, G. E. Hardy and M. V. Subbarao, "On th Schnirelmann identity of k-free integers", Indian Journal of Mathematics, 46-55, 1978. Mathukumalli Vidyasagar was born in Guntur, India on September 29, 1947. He received the B.S., M.S. and Ph.D. degrees in electrical engineering from the University of Wisconsin in Madison, in 1965, 1967 and 1969 respectively. Between 1969 and 1989, he was a Professor of Electrical Engineering at Marquette University, Concordia University, and the University of Waterloo. In 1989 he returned to India as the Director of the newly created Centre for Artificial Intelligence and Robotics (CAIR) in Bangalore, under the Ministry of Defence, Government of India. Between 1989 and 2000, he built up CAIR into a leading research laboratory with about 40 scientists and a total of about 85 persons, working in areas such as flight control, robotics, neural networks, and image processing. In 2000 he moved to the Indian private sector as an Executive Vice President of India's largest software company, Tata Consultancy Services. In the city of Hyderabad, he created the Advanced Technology Center, an industrial R&D laboratory of around 80 engineers, working in areas such as computational biology, quantitative finance, e-security, identity management, and open source software to support Indian languages. In 2009 he retired from TCS and joined the Erik Jonsson School of Engineering & Computer Science at the University of Texas at Dallas, as a Cecil & Ida Green Chair in Systems Biology Science. In March 2010 he was named as the Founding Head of the newly created Bioengineering Department, a position that he relinquished in July 2013. In January 2015 he received the Jawaharlal Nehru Science Fellowship and since then he has been dividing his time between UT Dallas and the Indian Institute of Technology Hyderabad. His research interests are in the broad area of system and control theory, and its applications. At present he is interested in the area of compressed sensing, that is, finding sparse solutions to large under-determined problems, and the intersection between compressed sensing and control theory. On the applications front, he is interested in applying ideas from machine learning to problems in computational biology with emphasis on cancer. 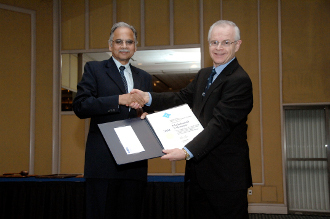 Vidyasagar has received a number of awards in recognition of his research contributions, including Fellowship in The Royal Society, the world's oldest scientific academy in continuous existence, the IEEE Control Systems (Technical Field) Award, the Rufus Oldenburger Medal of ASME, the John R. Ragazzini Education Award from AACC, and others. He is the author of eleven books and more than 140 papers in peer-reviewed journals.